← Point/Counterpoint: Are Flavored Vodkas American? There are two handshake positions you can use for this. 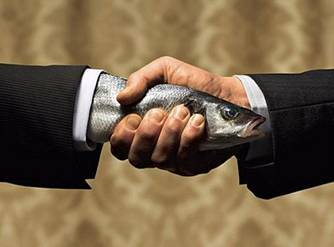 Many websites claim that you should do the standard handshake, pictured above with a dead fish, but these so-called experts fail to mention the slap-five hand shake, where both parties hold their arms in front of them at a 90 degree angle, with their hands pointing to the air. This will then become a high-five that turns into a clasp, centered around the thumb. With either the handshake, or the clasped high five in place, you are ready to go to step two. 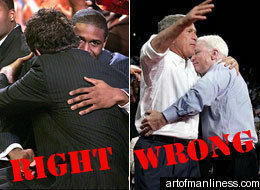 We feel like we shouldn’t have to point this out, but at this point in the Man Hug, it is generally not considered acceptable to lick the Man Hug recipient’s face. You know, unless you’re getting that kind of vibe. At which point, we mean, that’s not our thing, but go for it, we wish you nothing but happiness. You should tap the other party’s back no less than two times, but no more than four. Any less, and you’re not even there long enough to call it a hug. Any more, and you’re technically trying to burp the person. 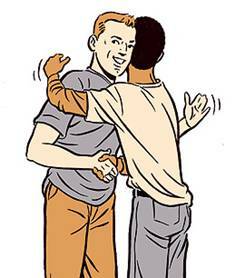 After many years of practice, you will eventually be able to master the art of the Man Hug, and feel like you are culturally relevant male member of American society. As for our female readership, you will now at least be able to recognize when a Man Hug is performed incorrectly, and spurn those who failed in their Man Hug appropriately. 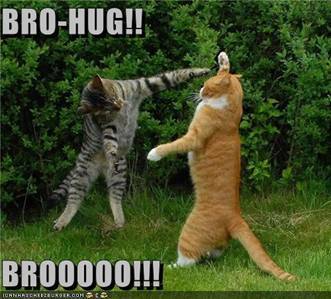 Our final lesson for Man Hugs will be a brief list of places where performing a Man Hug might be viewed “socially unacceptable”. 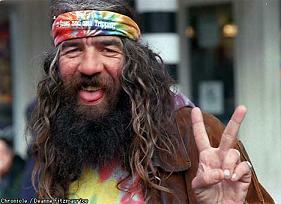 o Too informal, plus there’s always that one guy who……lingers. o This seems self-explanatory, but we’ve gotten several emails about this. Trust us, your wife does will not appreciate a Man Hug as your first matrimonial act of intimacy. No matter how much she likes sports. o You might assume that the knives make it more manly. Trust us, there is nothing manly about looking like you showed up to a PETA protest wearing fur. Oh, and the whole “Killing your friend when you accidentally stab him” thing. That too. 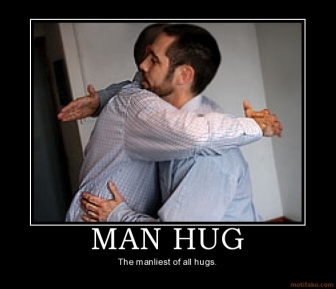 o You’ll be breaking so many man codes if you even think about giving a Man Hug to the man at the Urinal next to you. That’s rookie. Come on guys. So there you have it. Now that you know proper form and etiquette, we can lower the amount of Man Hug related injuries, which leads to over three thousand pride related hospitalizations every year. This entry was posted in America Fun Fact of the Day and tagged America, Andrew Jackson, British Dandies, Bro Hug, Dude Hug, Hippies, Hug, Jim Bowie, Man Hug, Wild West. Bookmark the permalink.